Bio technology drug approval projects are likely to take several years. Starting from initiation all the way to public use, drugs need to go through different approval processes in different countries pinpointing different targets of interest. 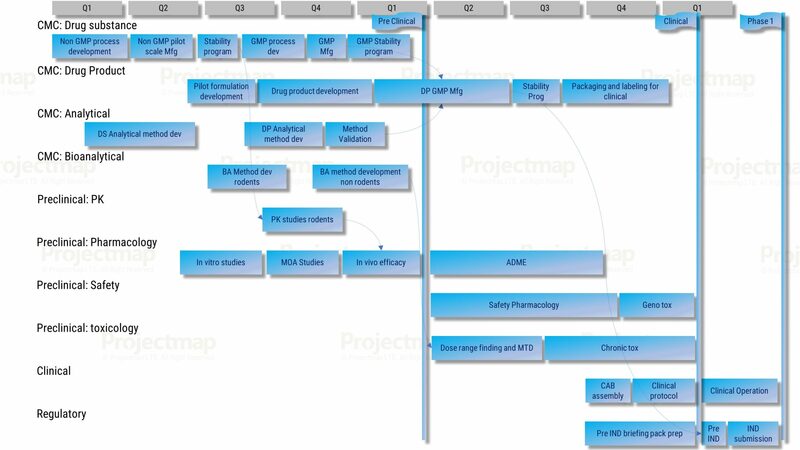 In this template we will cover the drug development process to become a Phase 1 ready only – from initiation to Phase 1 trials. Following these workstreams, the project can be controlled with relevant milestones – pre-clinical ready after approximately one year, clinical ready after another year and Phase 1 ready after 2 years or more. Links and dependencies between activities are presented in high level. Each quarter should be carefully planned to efficiently make progress toward phase 1. Building the CMC process correctly, enables to start the pre-clinical activities earlier and saves time when heading the clinical phase. Once the pre-clinical phase started the focus moves toward the regulatory submission and all activities are targeted to accurately collect and prepare the materials for the Investigational New Drug (“IND”) application. Getting IND approval actually moves the process into Phase 1 and beyond this template scope.